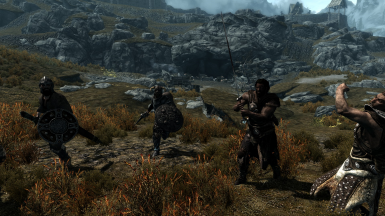 Skyband is a mod which makes Skyrim's bandits realistic and brutal. Great for roleplaying and for those who want a more realistic feel to the game. 2018-04-16: Bug fix; Anska will now appear properly as female. Updated and refined, a new version of Skyband is now available for SSE! "Hmm, wizards, now that's power. Bet they got that secret magic, can turn wood to gold. Yeah. Wish I could turn wood to gold." In the vanilla game, the whole idea with magic is ruined by the fact that it is so common it doesn't even feel special anymore. If you know how to cast spells, you should really stand out from the majority of the people you encounter. This is supported both by lore, and by common sense for how to make a more realistic and interesting mod. And what large group of people would you certainly not except being able to master the arcane arts? Bandits of course. Skyband modifies the leveled lists for all the bandits that randomly spawn. It doesn't make any sense that in the vanilla game, every single bandit camp has at least one resident mage. With Skyband, aside from the occasional Orc brute and Wood Elf archer, the bandits of Skyrim are now almost exclusively human non-mages, with Nords being the by far most common race. Bandits are bandits for a reason. They are brutal, stupid and uneducated. They don't have extensive knowledge of magic, something that many things in the game also implies. Or why not just let wolves, bears and skeevers cast fireballs as well, while we are at it? There is probably some poor little mage somewhere in Skyrim who joined some forgotten bandit camp or so, but your average bandit does NOT know magic. Axes, swords, hammers, daggers and bows are what you should expect to face. If you really like to fight mages though, you don't need to worry, since there still are plenty of mage lairs, Forsworn, Draugr, Falmer and other unconventional creatures spread out in the game. Using the Nexus Mod Manager is the recommended method. If you know how to download and extract files manually, you probably don't need any tutorial. Skyband is supposed to make bandit encounters feel much more realistic, and put emphasis on that despite Skyrim being a magical land, there are very many "normal" people as well. Additionally, magic becomes a lot more interesting when it suddenly isn't so common. While not necessarily making the game any harder, Skyband is directed towards players who want a more immersive and realistic experience in Skyrim. Wildcat is a highly recommended mod which adds to the combat realism, such as when fighting bandits. Skyband was developed as a direct opposite of OBIS, a mod which added more unrealistic mage bandits. OBIS makes the bandits feel like they come from Harry Potter. Skyband makes the bandits feel like Skyrim's equivalent of a real criminal gang. In conclusion, OBIS will probably be more interesting, but Skyband will be more realistic. 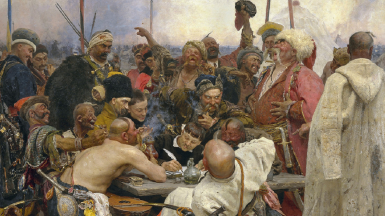 Notice: Some people have assumed there are no female bandits, which is incorrect. They still do exist. All you need is Skyrim. Skyband should be compatible with most mods except from mods that change the leveled lists for bandits. Skytoxin - Poisons are extremely potent and dangerous. Skywild - The wildlife of Skyrim is actually dangerous. Serious Crimes of Skyrim - Crimes committed by the player are taken very seriously. Gravity of Nirn - Fall damage is the same for everyone and at truly realistic levels. Skylock - Locks are actually hard to crack. Skydrown - Diving is less realistic but more realistically challenging. Skyswim - Swimming is encumbering if you do it wrong. Skyrace - A race mod which attempts to make Skyrim more realistic and races more diverse.